In my continuous bid to understand the world through the study of stories and storytelling, I happened to hit a particular roadblock. Said roadblock was a concept that I found seriously difficult to understand, but without which I could not proceed in my studies. Therefore, taking a cue from MCU villain catchphrase "Discovery requires experimentation" I decided to perform a social experiment… more like an opinion poll. The objective of the poll was to understand if public opinion associated a national symbol with the particular concept that I'm interested in. For my poll I chose the national flag. Flags and banners have a primarily military origin, serving to distinguish between sides in a battle and various other military purposes. Nevertheless, national flags are the most conspicuous national symbols used worldwide. National anthems stand at second place and national emblems are used far more sparingly, especially in public. I also included the answers (and comments) from this question posed on the forum called Quora, included some downvoted comments which I nevertheless felt were relevant to my question. This brought up my total no. of data points to about 50. Here's a word cloud of the Facebook poll. National symbols are useful in transcending and redefining individual identity, by giving people a sense of higher purpose. This is not about the government or its machinery, but the social cohesion of the people. 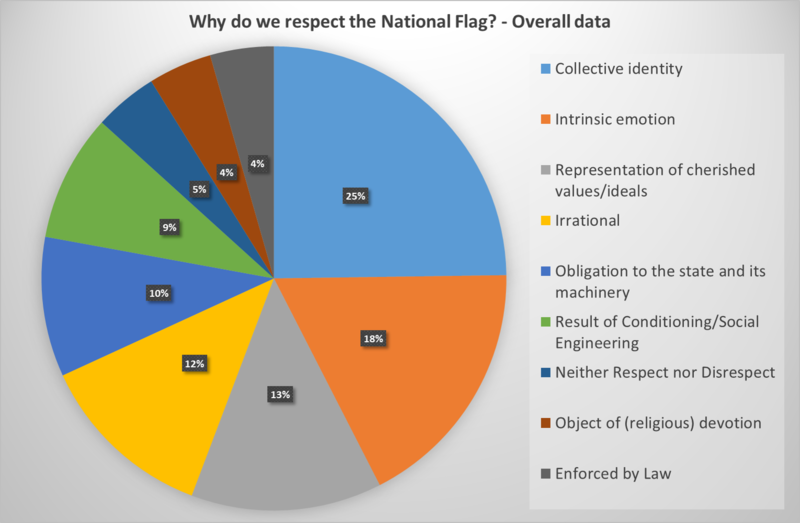 People are moved by genuine filial/fraternal affection for the country and its citizens and therefore respect the national symbols spontaneously. This is best demonstrated during sporting events. National symbols are designed carefully to depict the core values and heritage of the nation, and respect for the symbols is a form of understanding and internalizing those values. 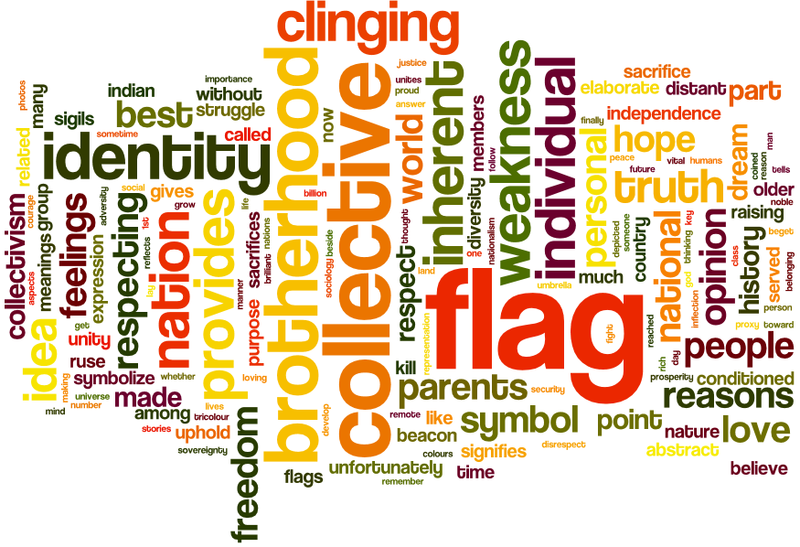 Respecting national symbols due to any reason, especially emotional ones, is ultimately irrational. Nationalism is divisive and counterproductive, and ultimately causes more harm than good. The state and its machinery deliver important services to the people in the state, including fundamental rights and security. Therefore respecting the symbols of the state is part of the social contract between the state and its people, whereby the people recognize and thank the state. Respect for national symbols is a learned behaviour, promoted by the state/politicians, often due to their own agenda. 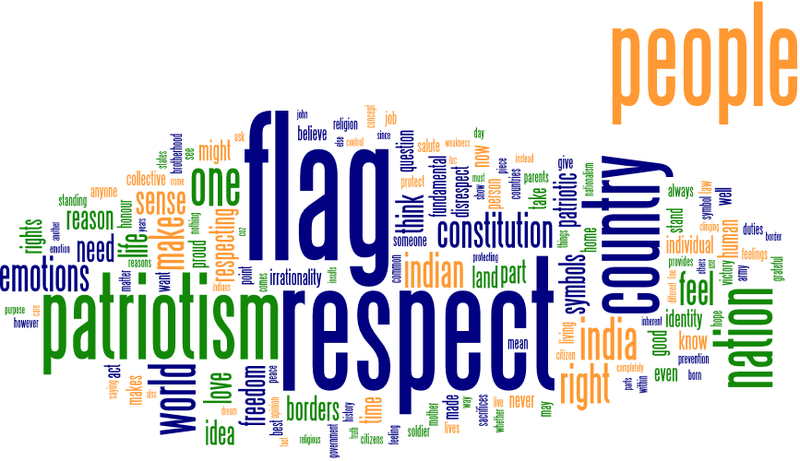 National symbols are to be merely acknowledged, and are not worthy of either respect or disrespect. In India, the Prevention of Insults to National Honour Act,1971 makes it a crime to disrespect the national flag and anthem. Hence the show of respect. Nationalism as a type of religion, and consequently National symbols are compared to sacred objects. Sacred objects should be respected irrespective of adherence to religion. Interested? Read more about international attitudes in the next post.